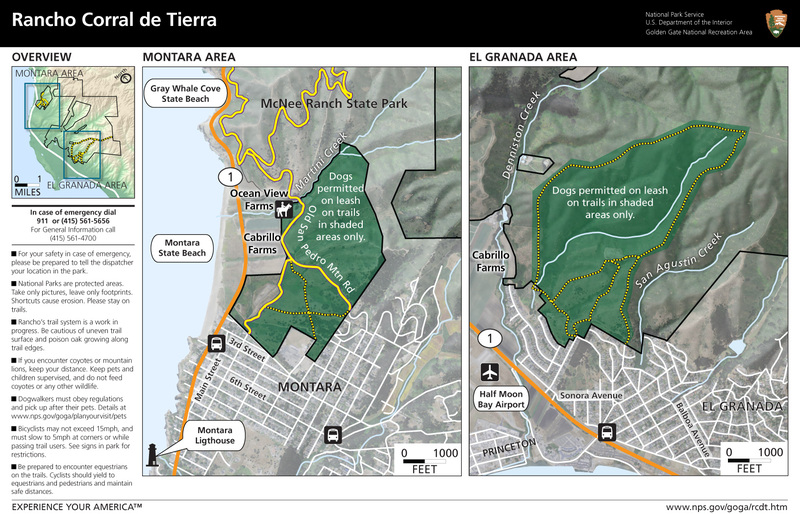 A Rancho Corral De Tierra trail we like is in El Granada, CA, just east of the Half Moon Bay Airport. It follows a small 1-2 mile inland loop at the southern end of a large 3,800 acre park. See exact trailhead location below and a rough trail map (see right side of map). Rancho Corral De Tierra is the newest National Park in the SF Bay area. It was part of an early Mexican Land Grant in 1839 and became a national park in 2011. Golden Gate National Recreation Area (GGNRA) maps show the full extent of this park. Access: Access by car is quick and easy. The trailhead is only 3 blocks east of Highway 1. The trail itself is a 1-2 mile loop that often follows ridgelines but can get a bit steep at points. Nature: This wild coastal land is about as close as you get to the way things originally were. It connects to more than 27,000 acres of contiguous protected open space (including McNee Ranch State Park, San Pedro Valley County Park and San Francisco watershed lands) if you are interested in longer, much more rugged hiking. Beauty: We like the small steep mounded hills. They are often shrouded in a lovely and usually warm coastal fog. The vegetation tends to be native shrubs, which are not imposing but are still interesting if only because of their wildness. Views back west through the hills to the airport, ocean, and Princeton Harbor are beautiful when there is no fog. Uncrowded: Once you go about a half mile in on the trail the feeling is like being in a wilderness. You may encounter a few lone hikers. Dogs: Dogs are allowed (on-leash) on this 1-2 mile trail but not in the open spaces beyond.